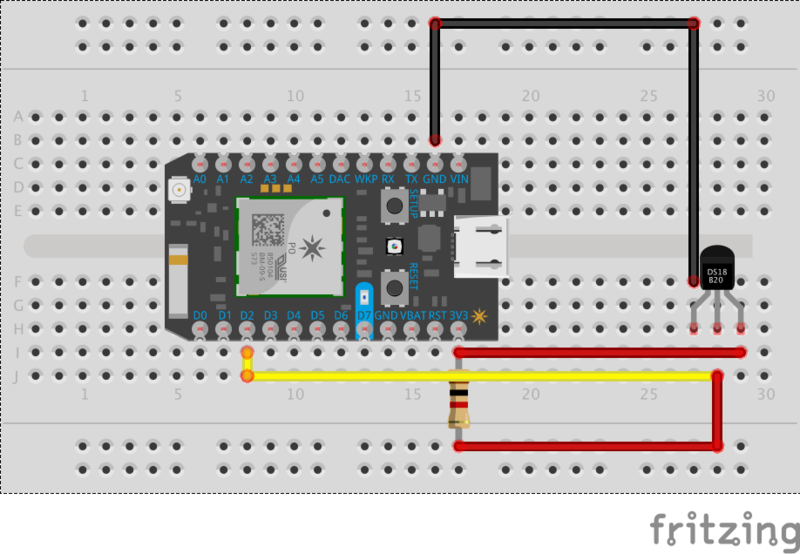 R2D2 will connect to the particle.io IoT cloud and display the outside temperature so I can dress my kids weather appropriate. 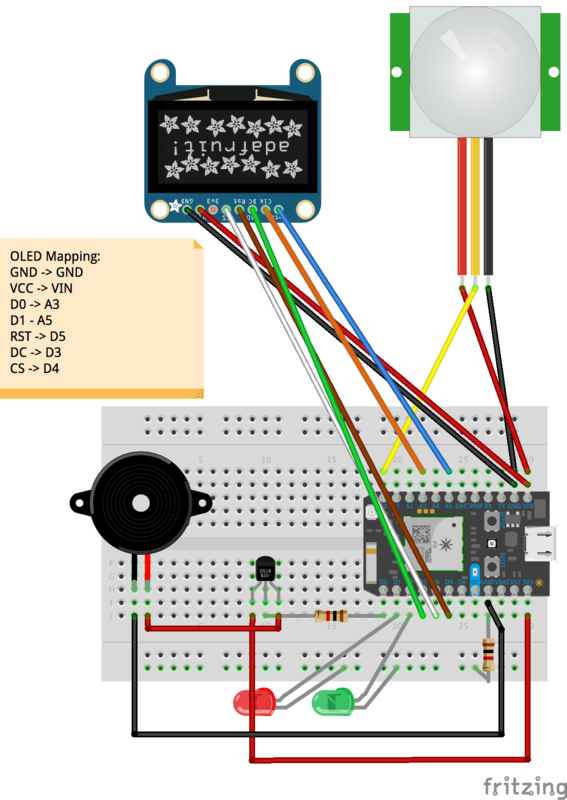 R2D2 will connect to the particle.io IoT cloud and display the outside temperature so I can dress my kids weather appropriate. My kids are always asking me what they should wear to school. Now they can ask R2D2. With a wave of their hands R2D2 will respond with a series of sounds and lights. The color of the LIFX light, and the LCD display, will tell my kids the outside temperature and what they should wear. Watch my son Jacob test the new prototype. For this project I used 2 particle.io Photon chips. The first chip is outside, in a weather proof box, that reads the temperature and sends it to the particle.io cloud. The second chip is inside R2D2 and includes a motion sensor that when triggered will beep, flash LED's, display the temperature on an LCD, and turn on a LIFX bulb. The color of the LIFX bulb will change based on the temperature. Blue is cold, yellow is warm, and red is hot. Bellow I will outline how I built each component. The outside Photon reads the temperature and sends it to the particle.io cloud. The chip is inside a weather proof box so it doesn't get wet. #include "OneWire/OneWire.h"// This #include statement was automatically added by the Particle IDE. // Start the serial out. // Turn the power to the temperature sensor on. // Publish the temperature to the particle cloud and print it to the serial out. This Photon chip is inside R2D2. As you'll see in the pictures below I pulled out all the stuffing from the R2D2 toy, inserted the electronics, and then put the stuffing back in. The chip has one action triggered by the motion sensor. The action beeps, like R2D2, flashes some LEDs, displays the outside temperature using the LCD display, and turns on the LIFX light bulb to the appropriate color. The color is determined be the temperature. Red means it's hot outside, yellow means it's warm, and blue means it's cold. Here are some pics then the code. static const int LIGHT_TIMEOUT = 5 *500; // Keep the light on for 5 seconds. // Headers currently need to be set at init, useful for API keys etc. // Subscribe to the temperature produced by the particle chip outside my house. // Open the serial port for writing. // Initialize the LCD display. // Turn the LIFX light off. It may or may not be turned on but we don't know. // The light is on. // Check to see if we need to turn the light on. // Trigger the R2D2 action which plays some R2D2 sounds, flashes some LED's, displays the temperature, and turns on the LIFX bulb. // Flash the red and green LED's. // Display the temperature on the LCD display. // Turn the LIFX bulb on. // Turn off the LCD display and the LIFX bulb. // Turn the LIFX light off. // Turn the LIFX light on. // Calculate how many milliseconds there are per HIGH/LOW cycles. // Play the note for the calculated loopTime. Provides support for the Dallas One Wire protocol on the Particle core/photon. Particle core/photon library port of Dallas Temperature Sensor library. Firmware library SparkFun's Photon Micro OLED Shield. This is the core graphics library for all our displays, providing a common set of graphics primitives (points, lines, circles, etc.). Http Client Library for the Particle core/photon. The LIFX light bulb can be controlled via their local UDP API. particle.io had a bug which prevented me from using UDP. LIFX also has an HTTP API but it is only available over HTTPS. particle.io doesn't support https out-of-the-box. I tried an SSL library but couldn't get it to work. Therefor I created a proxy Google App Engine web app that is available over HTTP which then proxies the call to LIFX over HTTPS. Here is the code for the single controller in the proxy app. The entire app is included in the attached source code. * Created by randyfindley on 11/6/15. This Photon reads the outside temperature and sends it to the particle.io cloud. This Photon monitors motion and when triggered displays the temperature. Thanks to Steph, Erik Kringen, and Paul Kourany.